I am a lotion and moisturizer hoarder, or used to be. I have always suffered from dry skin; probably a combination from living in Texas, taking long hot baths, and hardly being thirsty, requiring me to remember to drink. Due to my dry skin I have owned a countless number of lotions and moisturizers, and would apply and reapply them multiple times a day, all without feeling my skin was healing or becoming hydrated. I have been using one moisturizer for a year now. This was not bought at a store, but made at home for pennies. I typically only apply it once a day, but sometimes I use it twice, just because I love the smell. When I decided to take my moisturizing needs into my own hands, I first looked up the ingredients being used in the lotions and moisturizers I already owned (about 10 of them) – water (which is a filler and does nothing to help your skin if not consumed, and can actually dry your skin out by removing natural oils), alcohol (which dries out skin), fragrances (you never know which combination of chemicals are being used –check out ingredients that can be used under the label “fragrance”), refined vegetable oils (these damage skin by the free radicals created), and chemicals I couldn’t pronounce. No wonder my skin was still dry; natural ingredients were hardly available, even in my expensive moisturizers that were made by a company known to be nature-based. Because of this, I threw them all out, or gave them to relatives I knew would use them. The second thing I did was research the effects of products in my kitchen with a long shelf life to see the effects of them when applied to the skin. The benefits I found were in coconut oil, almond extract, and grape seed oil. Coconut oil is amazing when applied directly to skin. As was discussed in Benefits of Coconut Oil for the Skin, coconut oil “is reported to be effective in treating eczema, psoriasis, dermatitis, skin infections, acne, and dry skin. There are also claims that coconut oil helps prevent premature aging and reduces the appearance of wrinkles.” The reason coconut oil, specifically organic virgin coconut oil, is so beneficial is not just because of its ability to make your skin feel softer and smoother, but because it prevents free-radical formation and provides protection against skin damage and slows or reverses aging of the skin. Almond extract helps seal in moisture and strengthen skin. Almond extract is also said to have natural healing abilities. Grape seed oil has antioxidants called procyanidolic oligomers (PCO’s). PCO’s help slow the aging process, help decrease inflammation, and can help clear up acne. Grape seed oil also helps prevent pores from clogging and breakouts from forming. I know I went a month without my homemade moisturizer, while living in the very dry climate of Decatur, Texas, and my skin was cracking and bleeding. As soon as I was able to make more of it, after a week of use my skin was healed, soft, and glowing. 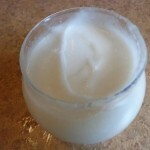 Now that you know the benefits of my homemade almond coconut oil moisturizer, I bet you are wondering how to make it. Combine all ingredients in a bowl and whisk until creamy and fluffy, then place into container of your choice. Keep it at room temperature to prevent melting or hardening. 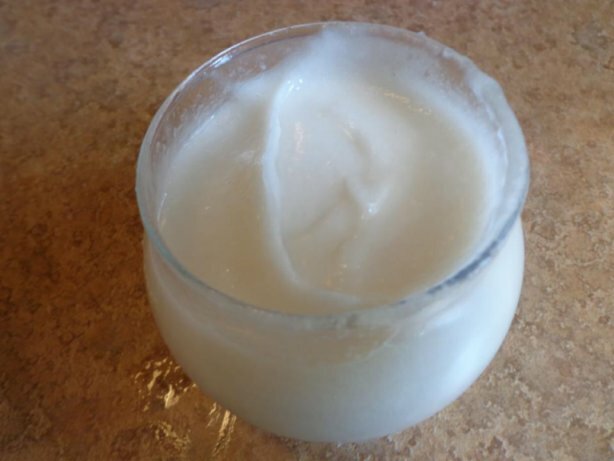 Dr Bronner’s Fresh-pressed Virgin Coconut Oil White Kernel Unrefined 14 Fl OzTips: Organic virgin coconut oil will make the moisturizer look more like pudding while the cheaper coconut oil will make it look like whipping cream. If the almond coconut oil moisturizer melts, place it in the fridge to firm up, then re-whisk, and if it hardens, heat it to soften (Try a blow dryer. A microwave for 10-15 seconds works, but could destroy nutritional benefits); then re-whisk. Only use a small amount when applying. I use about a fingertip worth on my entire face. Also, let it absorb as long as you can, but if need be, dab off the excess. The links supplied are for organic products. Making your Almond Coconut Oil Moisturizer with organic ingredients is beneficial for those with sensitive skin. Is using an extract “safe” to replace imitation vanilla? Also is there anything i can use if i don’t have grape seed oil? Thank you! I honestly have mixed emotions on the extract (it’s natural but it has alcohol). I know a lot of store bought products have alcohol in them, I just don’t like the drying effect it has on my skin. As far as the grapeseed oil, you can try olive oil or sunflower oil. May i replace almond extract in to almond oil ? Pls give your suggestion .